My TV News story about my citation and impound was all over talk radio on Tuesday September 23rd. I called into the Todd and Don show and we had an extended chat. Apparently, they had been talking about it all morning long. The clips are linked below. Previous talk radio hour discussions. Here is the 10PM version with a different edit and sound bite. And here is the entire interview from my dash cam. Speed up for time purposes. You really cant hear anything as the doors are closed. I put my new Action camera to action on Friday night after APD and the City Transportation department cited me for not having a Chauffeurs permit or operating authority. Below is a News story that KVUE did at 6PM and 11PM. Also links to the entire bust is shown below. Interesting Snippet. While taking the undercover agents I see a car going the wrong way down Gaudaulpe St. I recent purchased this new Action Camera SJ4000. It was $82 on Amazon and competes with the GoPro Hero camera that sells for $400. I have to say Im very impressed. The picture can record up to 1080P and has the same wide angle lens as the GoPro. It even includes a LCD display to help align the camera. The GoPro has not display, so you have no idea how it will look until you download the videos. Here is a link to a great review and report of issues. Here are some videos that I have taken already. This one is just around my subdivision. Here is a slowed down video where I caught a lighting strike. Today Austin City Council Chris Riley had a press conference where he talked about a temporarily proposal to allow TNCs (Transportaion Network Companys) to be legal within the City Limits of Austin. I attended the event and was interview by Fox Austin, KVUE and KLBJ talk radio. Here are the video clips during the 6:00PM Fox News Story. Talking about the impact of Interest Rates and the value of the VIX calculation. 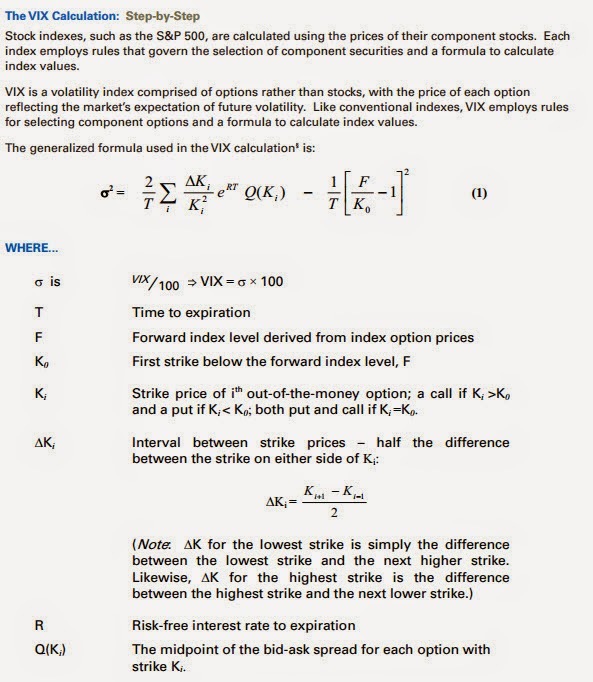 Below is the acutal formula for calculating the VIX. Notice how the VIX is the sum of many variables and a multiple of R, which is the Risk-free interest rate. So as interest rates go down, the VIX will go down. As interest rates go up the VIX will go up. Everything else is based on option pricing.